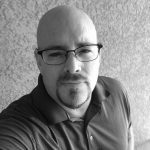 After working in the Granite Industry as a CNC operator drafting in AutoCad for 5 years, John moved from Boise Idaho to Attend Full Sail University in 2014 and got his degree in Web Design and Development. He has worked in many positions from server admin to Front-end Designer on WordPress sites. John has a passion for the educational industry and it seems it is a great fit for his humorous personality. He was a commercial fisherman in Alaska for 5 years. He is a journeyman Granite Fabricator and Installer. He has a passion for Arduino and Hardware. He is a scratch golfer.